The Lalaurie Mansion was built in 1832 by Dr. Louis LaLaurie and his wife, Delphine. The couple were both well known socialites and enjoyed entertaining on grand scales at the house which saw them quickly rise up to the top of New Orleans social ladder. The mansion is three stories high and the outside has some what of a plain appearance, but the inside was designed to be somewhere to entertain guests and included many impressive design features, such as hand carved faces and flowers in the mahogany doors. The aim of the house was to impress guests which it did very well and the Lalauries's saved no expense to impress. The house was filled with the finest china and expensive imported Oriental fabrics. The house went through a number of owners and served as a couple of businesses after the Lalaurie's no longer resided there, including a furniture store and bar, both of which didn't work out and the mansion today is a private residence. 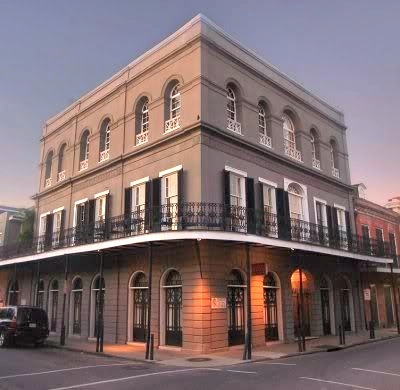 New Orleans is thought to be Americas most haunted city and the Lalaurie mansion is one of the most, if not THE most haunted building in the city. Marie Delphine Lalaurie, also known as madame Lalaurie is one of New Orleans most well known serial killers. Madame Lalaurie and her husband owned a number of slaves as did many people in the area during those times, but it is the treatment of those slaves which is the reason behind the hauntings at the mansion. She is known to have been right at the top of the New Orleans social circles and everyone knew her as a beautiful and intelligent women. Which is why everyone was so outraged to find out her secret. Everyone knew she kept slaves in the house and thought nothing more of it, but on April the 10th, 1834 a fire broke out in her mansion and a fire team responded to the emergency. The crew quickly quelled the flames but upon searching the whole mansion to check it was safe they discovered something very sinister in the attic. The fire crew found a number of slaves chained up in the attic which all showed sign's of long term torture, some of which was beyond barbaric. Also various limbs of slaves and random body parts were spread out across the room. The slaves were reported to have asked the fire crew to kill some of them to put them out of their misery. After the fire the town found out about Madame Lalauries treatment of her slaves and were outraged, they organized a mob and ran-sacked the mansion, causing Madame Lalaurie to flee and after that night she was never seen again, though it is thought she returned to Paris were she died. After her disappearance stories of the slaves treatment came forward, including a cook who was permanently chained to the stove. It turns out the cook started the fire in a suicide attempt as she didn't want to be taken to the attic as that was the place slaves were tortured until death. There is also a story about a young girl who was brushing Madame lalauries hair and hit a snag, she ran out on the roof were a neighbor saw her being chased by her owner carrying a whip. The girl jumped off the roof to her death instead of ending up in the attic, she was later buried on the mansion grounds. The number of slave who are thought to have died at her hands is estimated to be close to 100. With the stories about her torture becoming more horrific after her disappearance through story telling. Tales of her gauging eyes out and breaking bones and resetting them in odd positions to make human crabs, also cutting stomachs open and tying intestines round peoples waists and sowing mouths shut are but a few of the tales circulating about the mansion. How true these particular tales are is unknown, though it is a fact that she tortured her slaves in brutal ways. As for the actual hauntings at the Lalaurie mansion it would be alot easier to list the things that haven't been experienced here. Apparitions, orbs, voices, being touched, cold spots, evps and voices and screams are common place here. Due to the shear level of pain and suffering and death that this building has seen it certainly seems to deserve its name as the most haunted building in the city.